Pembroke celebrates after senior captain Carly Birolini scored the tying goal with 18.1 seconds left in a 2-2 draw at Hingham on Jan. 9. 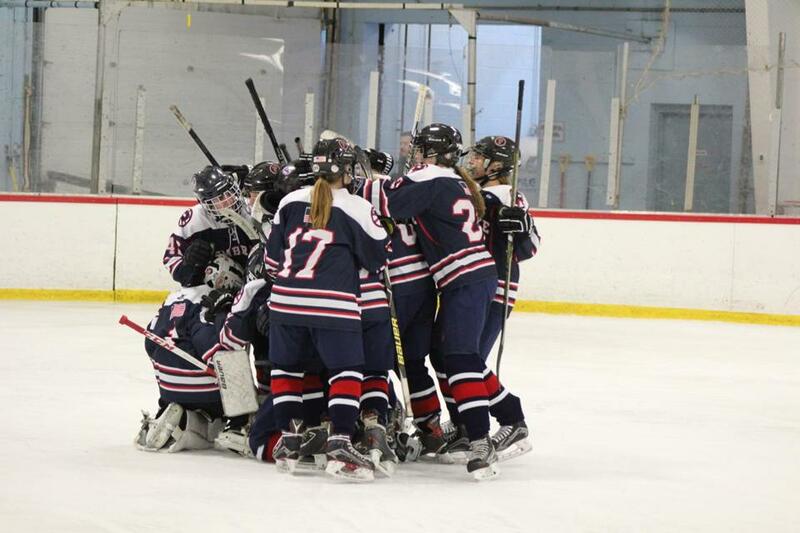 In its fifth season as an independent program, hard work has been the mantra for the Pembroke girls’ hockey team. The Titans have thrived not solely on talent, but on heart, effort, and desire. Initially, Pembroke shared a co-op agreement with Whitman-Hanson for six years. But since the co-op ended, by mutual agreement — with Whitman-Hanson now teaming up with Silver Lake — Pembroke has continued to flourish. With a 5-3 victory over Notre Dame-Hingham last Friday, Pembroke earned its first win over NDA, netted its 70th overall win since going solo, and climbed back into the Globe’s Top 20. “In a nutshell, its unselfishness and everybody working together,” said seventh-year coach Bill Flynn. Pembroke has benefited from a strong youth program and support from the community. Flynn recalled a moment four years ago when many members of the current team attended a varsity game to acquaint themselves with the program. An 11-1-2 start this season was not expected by Flynn, or his players, particularly with just 12 skaters and a pair of freshman goalies on the roster. Despite the low numbers, Pembroke still manages to field a balanced lineup in which every player contributes. Senior captains Carly Birolini, Nikki Rinkus, and Emily McCabe have been instrumental in instituting a family atmosphere. A four-year varsity player, McCabe, shifted to defense for the first time this season. She volunteered to make the move after the graduation of the team’s top four defenders. She has been Pembroke’s best player on the blue line. Team-bonding has long been a big part of Pembroke’s success. As important as it is to build relationships on the ice, doing so off the ice is what draws the team closer. Pembroke earned MIAA tourney berths in each of its first four seasons and has qualified again this season. Its postseason history includes two Division 2 quarterfinal losses in 2016 and 2017. This year’s senior class is determined not to let history repeat itself. With hard work comes reward. The Titans earned their first victory over Notre Dame-Hingham and captured the Judy Gormley Classic Championship in December with wins over Plymouth and Bourne. ■ Wednesday night’s showdown between Methuen/Tewksbury, ranked second in this week’s Globe Top 20, and No. 3 Andover has been circled on the calendar by both teams since their first meeting on Dec. 18. Andover (12-0-1) blanked M/T, 3-0, the lone defeat for the Red Rangers (11-1-1) this season. Methuen/Tewksbury coach Sarah Oteri was a four-year player at Andover (Class of 2010) and served as the Golden Warriors junior varsity coach for two seasons before joining the Red Ranger program in 2015. Oteri is 1-1-2 against Andover. ■ What has been the key to Franklin’s hot start this season? Just a group of players who love the game. The Panthers skated to an 11-1-1 start, which has only served as motivation to play harder. ■ With a 3-0 win over Archbishop Williams, Austin Prep senior goalie Hannah Aveni recorded her 27th career shutout – breaking the school record of 26 set in 2016 by Caty Flagg . Wednesday, Duxbury at Braintree (at Zapustas Arena, 5:30 p.m.) — In a nonleague matchup, the fifth-ranked Dragons put their unbeaten record on the line against ninth-ranked Braintree. Wednesday, Andover at Methuen/Tewksbury (at Methuen High Rink, 7 p.m.) — The Red Rangers’ only loss this season was a 3-0 defeat to host Andover on Dec. 22. Can they return the favor at home? Friday, Wellesley at Notre Dame-Hingham (at Rockland Arena, 5:40 p.m.) — On Friday, the Cougars look to move above .500 against ranked opponents when they take on Wellesley. Saturday, Arlington at Reading (at Burbank Arena, 7:45 p.m.) — With the Rockets in danger of dropping out of the Top 20, they face a tough test against the visiting Spy Ponders. Saturday, Braintree at Walpole (at Rodman Arena, 5:20 p.m.) — Another Top 20 battle for the Wamps, this time a rematch on the road against BSC rival Walpole. Braintree won the first meeting, 4-1. Sunday, Longmeadow at Masconomet (at Valley Forum, 1:40 p.m.) — While the Chieftains have been teetering above .500, the Lancers have a few surprising wins under their belt and are surging toward a postseason berth. Dan Shulman can be reached at dan.shulman@globe.com. Jenna Ciccotelli, who contributed, can be reached at jenna.ciccotelli@globe.com.